The journey of weight loss begins with a single step -- ideally, a step followed by another, and then another. Running is an effective way to improve your health in a number of ways. If you've set a weight-loss goal and are determined to see results by running, the key is to spend several hours per week in your running shoes. Even a moderate amount of running every week can improve your health, but if you're serious about weight loss, you must devote a significant amount of time to this form of exercise. Given the number of variables that impact weight loss, no sure-fire amount of running is guaranteed to lead to a slim body. In general, however, spending around 150 minutes running at a moderate pace per week can lead to results, provided you also consume a low-calorie diet. If you wish to have two days of rest, plan to run for 30 minutes on the five other days of the week. Burning fat to lose weight is all about burning more calories than you consume. Running is an ideal exercise in your weight-loss journey because of its high calorie burn. You must burn 3,500 more calories beyond what you consume to lose a single pound of fat, and doing so is often possible in a week. One run can burn hundreds of calories. For example, a 200-pound person who runs for 60 minutes at 5.5 mph burns 986 calories, according to the University of Maryland Medical System. 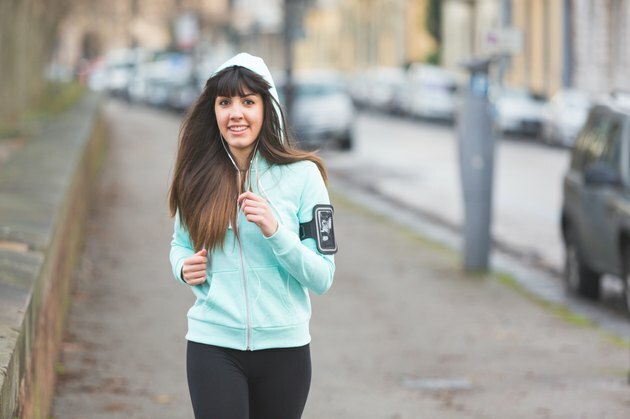 Running alone can greatly contribute to your goal of losing weight, but it shouldn't be your only form of exercise. Strength training is important to include at least twice in your weekly workout routine. This form of exercise burns calories at just a fraction of the rate of running. However, as you increase your lean muscle mass, you'll also elevate your metabolism to aid in the burning of fat. Visit the gym to lift weights or strengthen your body at home with body-weight exercises. Even if your sole workout focus is weight loss, running also improves the strength of your bones and muscles and increases your cardiovascular endurance. Once you've lost weight, running can help you maintain your fit body. Always visit your doctor to ensure running is the right activity for you. If you've led a sedentary life, build up to running by walking briskly for a period of weeks.